Does a Red Heifer Being Born in Israel Signal the End of Days? | Have Ye Not Read? The UK Daily Star published a lengthy article this week about a red heifer being born in Israel, claiming it signaled the “end of days” and the coming of the Messiah. Wow. “Bible Prophesy FULFILLED.” How about them beans? But let me ask you a question. If a red heifer being born signals the fulfillment of Bible prophesy “in both Christianity and Judaism,” exactly which prophesy are they talking about, and where is it written in the Bible so we can all go take a look at it? Indeed, the only mention of a red heifer in the entire Old Testament of the Bible, in Numbers chapter 19, which is about the laws of ritual purification. Open your Bible and read Numbers chapter 19. I challenge you to find me a single verse in that entire chapter stating that a red heifer being born in the end days in Israel signals the fulfillment of Bible prophesy regarding the end days and the coming of the Messiah. You can’t. Because it’s not there. It’s purely Jewish religious tradition, and not from the Bible at all. Not from the Old Testament. And not from the New Testament. It’s from the Fabricated Testament, i.e., the testament of sensationalistic Jewish religious tradition. Indeed, in the only chapter in the Bible that discusses a red heifer (Numbers 19), the heifer was a sacrifice needed to ritually purify anybody who’d touched a dead body. That’s it. Nothing about a Messiah. Nothing about the fulfillment of “end days” prophesy. Yep. It’s all based on “end time tales,” and not on the Bible, at all. But what happened to prophesy being “FULFILLED,” as the news headline promised in great, big self-important capital letters? Well, that was apparently designed to grab the attention of gullible and Biblically illiterate Christians who get their daily news from the headlines of online articles, while never reading the rest of the article. “The cow’s birth and sacrifice is said to proceed the construction of the Third Temple in Jerusalem. Again, cool beans, right? That article claims the “Messiah” was born in July 2018. And the claim was made by “a Rabbi,” so it must be true. Right? After all, no self-respecting Jewish Rabbi would ever lie to the goyim, would they? At least they got the “Jewish” part right. Think about that. The Christian Messiah came some 2,000 years ago. So now they’re tacitly admitting the Jews have a different messiah altogether. One, apparently, that was born in July 2018, and must be — what? — some two months old now? Maybe now they can start killing cows again. Hey, who needs Jesus when you can kill a cow and be purified? Again, silly me. 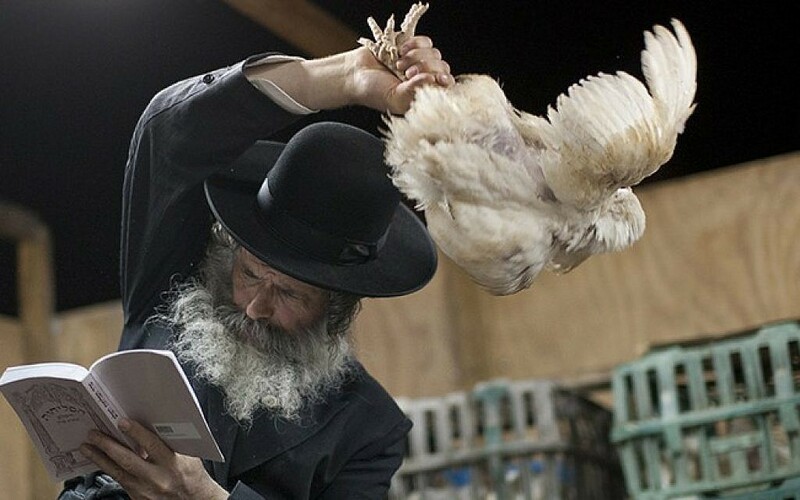 I thought the Rabbis preferred swinging chickens over their heads to get rid of their sins, in a ceremony known as Kapparot? But they don’t like the goyim to know about things like that, do they? So now we’ve gone from “Bible prophesy FULFILLED”…to “Rabbis suggest”…to “could be disqualified.” Hardly the stuff of legitimate Bible prophesies, much less a legitimate news story. 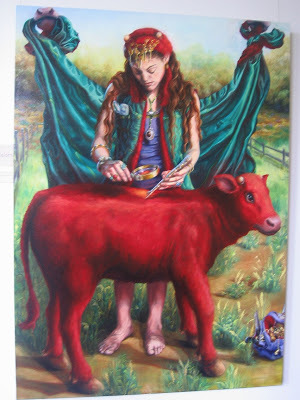 “Temple Institute bosses founded their Raise a Red Heifer in Israel program three years ago and have trying to breed a perfectly red cow. Look. Kill that blasted cow now, and send me a steak. Yum. That’s just about all it’s good for. “Prophecy in the Hebrew Bible states the cow must be red ‘without blemish’, and must not have worked. Ah, lucky number 10. Apparently, the number of the “end days”…the building of the so-called “Third Temple”… and the coming of the “Jewish Messiah.” Whodathunkit. We’ll probably see Lady Gaga wearing the number 10 now on her forehead, in her next music video. Or maybe Madonna. This must really be ticking off the Chabad Lubavitchers sect of the Jews, by the way, who claim their long-dead leader, the Rabbi Mendel Menachem Schneerson, was the expected “Jewish Messiah.” All of those annual pilgrimages by “pious Jews” to his grave, waiting for his resurrection, for nothing. But now we have (drum roll, please) The Baby Red Cow, Harbinger of the End Days. Sounds a lot like a very bad SciFi movie, doesn’t it. Something right up there with Sharknado 5: the Global Swarming. “Red heifers have previously been found by the organisation – who have then disqualified them for not meeting prophetic standards. ‘Does this perhaps mean that the appearance of a red heifer in these waning end times is an indication, a forerunner of the appearance of the Messiah himself, who will officiate at its preparation? ‘If there has been no red heifer for the past 2,000 years, perhaps it is because the time was not right; Israel was far from being ready. But it’s the arrival of the false messiah — the “Jewish Messiah” — and not the true Messiah that it’s building up to. The false Christ comes first, as 2 Thessalonians 2:1-4 clearly tells us. And that’s what we really need to be watching for, i.e., the attack on Iran spelled out in true Biblical prophecy in Daniel chapter 8, which ushers in the arrival of the “little horn” or false Christ (Daniel 8:9-12). Not some poor little red cow produced by a fanatical (and fantastical) Jewish cow breeding program. News stories like the one above are designed to deceive gullible and Biblically illiterate Christians. Learn what your Father’s Word actually says, by studying the Bible rather than getting your teachings from fantastical sources like the Jewish Rabbis. You’ll please your heavenly Father immensely. And just as importantly, if you’re diligent in your studies, no one will be able to deceive you into believing nonsense like that being reported in the news article above. Sad how people want to believe in everything but the word of God. Love how easy this was to understand.